A while back I posted about Partial Win: Canopies May be Saved. Here's what happened. What looks like a plowed field is where those oaks used to be. County staff showed pictures like that one at the Dec 9th Commission meeting, saying the canopy was saved. Indeed, part of it was saved. But the children crying in the house nearby don't agree that "the canopy was saved," nor do the adjoining landowners. Why should county staff, who never paid attention to the canopy until recent months except as an impediment to their highway plan, and who wanted to tear it all down, be the judge of what saving the canopy means? Suppose the Commissioners had told staff to save your house and they tore down your front porch and flattened your carport and then showed pictures of your house to the Commission saying "we saved the house!" Would you be satisfied? The pile of trees on the far side used to be canopy, and the bare dirt on the near side used to be canopy. Although once again the county tore down the south end (not shown). Why? For a wide curve. That one I doubt is even for 45 MPH, given that it doesn't look like they managed to acquire that much land back in the early 1990s. However, why did it even have to be 35MPH? This local rural neighborhood road doesn't go anywhere! The point here is that county staff did not do what the county Commission told them to do. The Commissioners left the fox in charge of the hen house, and quite a few chickens got eaten. This has all been said directly to the county Commissioners and staff in their public meeting of Dec 9th. Some of the Commissioners had some difficulty understanding what we were complaining about. I'm spelling out this part of it here so as to make it more plain. Yes, the commissioners did go out of their way to save the canopies, and we do appreciate that. But what they said to do is not what happened. And it's not the first time. If county staff had been taking care of business since June by communicating with residents of the road about the canopies, Commissioners wouldn't have had any need to scurry around at the last minute. And if staff had done what the Commission told them to on Nov 10th, Commissioners wouldn't have been listening to complaints about the canopy on Dec 9th. What we have here is a failure to communicate. A small amount of dialog could have prevented this situation. Dialog between June and November. Dialog between county staff and the local landowner after Dec 10th. Staff could have said to him: "here's what I understand your concerns to be and here's what we're going to do; how does that sound?" A few iterations like that between the county and him and other concerned parties and a result could have been arrived at that, while it may not have pleased everybody, wouldn't have been nearly as much of a problem. Here's the newspaper version of that Dec 10th meeting. More on other topics from that meeting in another post. If saying one thing and doing another is "the county way", does that seem right to you? How do we institute effective dialog between the county government and its citizens? 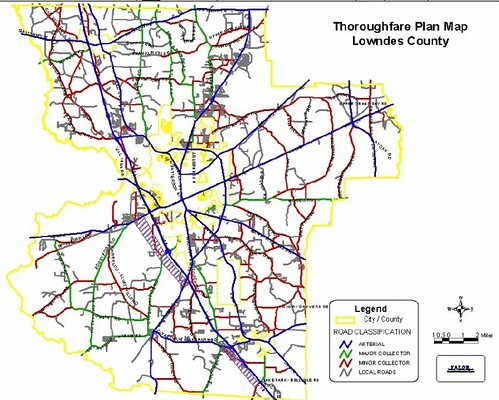 The first map below is from the Lowndes County Thoroughfare Plan dated January 28, 2003; this is the version currently on the county's public web pages. It plainly shows Quarterman Road (near the top center) as a local road. The public plan for paving Quarterman Road includes a 45 MPH speed limit. That's too fast for a rural local road. 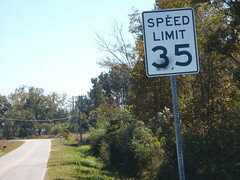 Even the already-paved part of Quarterman Road currently has a posted speed limit of 35 MPH (shown at right). That's the part the subdivision uses to go to work. I have never heard anyone complain that speed limit is too low. Why, then, would anyone need a faster speed limit on the rest of Quarterman Road, which has less traffic? As mentioned in the previous post, I understand that county staff and commissioners are concerned about their certifications, liability, and even, as we heard at the public commission meeting, about getting telephone calls in the night. Here is evidence that turning Quarterman Road into a wider, faster, collector road would not reduce any of those risks to county staff or commissioners, rather, by decreasing the safety of the road and its residents, such changes would increase risks to staff and commissioners. For some reason that "final solution" has an unfortunate historical ring to some of us in the path of "progress". However, at least the commission did decide to do something about the canopies, which is good. There's more in the VDT story. 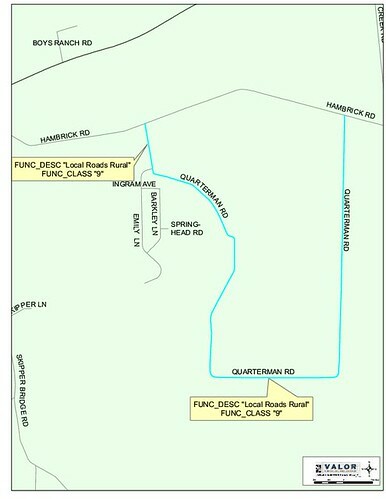 Pictured to the right here is the current classification of Quarterman Road by the county and state, as functional classification 9, "local roads rural". The South Georgia Regional Development Center (SGRDC, a state agency) classifies it in two parts, divided at the subdivision entrance, both as local rural road. More on that later. 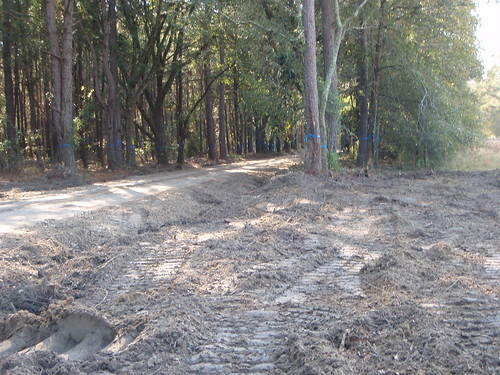 VALDOSTA — The Lowndes County Board of Commissioners will vote today concerning the proposed paving of Quarterman Road, located off Hambrick Tree Farm Road. The road is already partially paved, but some community members are concerned about the trees that line a section of the road that will have to be removed in order to complete the paving project. The commission will meet tonight at 5:30 p.m. at the County Commission Building on Savannah Avenue. If you're heading south down Patterson Street, turn right just before the overpass. That's Savannah Avenue. Several blocks down you'll see the water tower, and the commission office is on the left just before you get to the tower. If the parking lot is full, you can park across the street in the county fire station lot. We'll see if the county will consider the idea of treating canopy roads throughout the canopy as the benefit they are to the environment, beauty, and tourism. Thank you for meeting with us Friday. That was a good beginning to a conversation, much like I had hoped we would have after you attended our neighborhood meeting of June 5 in which we requested further options and my letter of August 7 in which I also requested further options regarding Quarterman Road. Now we're talking! I understand that there has been some confusion as to who wants to do what with Quarterman Road. This is why we have clarified neighborhood opinion with the petition of 26 October showing that a majority of households on the road and the owners of a majority of the road frontage do not want the road paved, at least not using the current plan the county is pursuing of clearing a 60 foot right of way and tearing down the tree canopy. Apparently there has also been some confusion as to what the state requires the county to do. I hear that some time in the past the county was planning to use state money to improve Quarterman Road. If so, I see how that money could have come with requirements from the state. 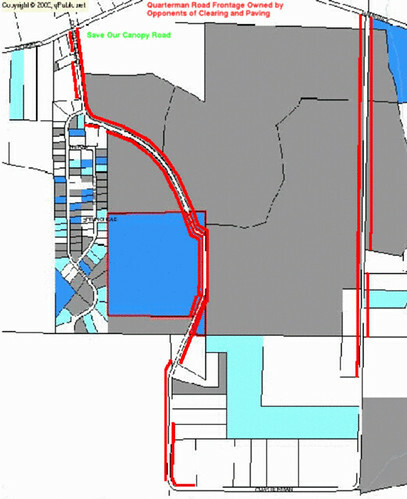 That would explain why the current county paving plan, which was originally drawn up many years ago, looks more like a state highway than a rural local county road. However, as I am sure you are aware, SPLOST VI is a local tax, not state money, so there are no such requirements along with it. I confirmed this with the District Engineer with GDOT. He tells me that the state makes no requirements on the county as to what to do with Quarterman Road, which the state classifies as functional class 9, a rural local road. Yesterday some of us finally got to talk to one of the paving proponents inside the county government to try to persuade him to Save Our Canopy Road In response we hear Safety! Professional engineer's opinion! AASHTO standards! Highest and best use! Why the county should determine highest and best use is different from what 60% of the households on the road have said in a petition is mysterious to me; more on that below. They claim they have to have a 60 foot right of way, that they can't have trees close to the roadbed, they have to have wide sloping ditches, paving just like Hambrick Road, and a 45 MPH speed limit. 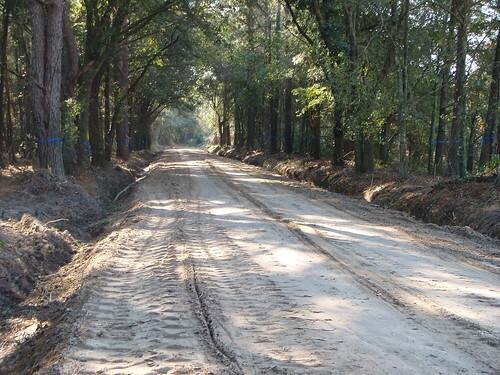 Yet just across the state line, Leon County, Florida advertises their canopy roads as tourist attractions, and both dirt and paved they have trees just as close to the roadbed as our canopy does now. 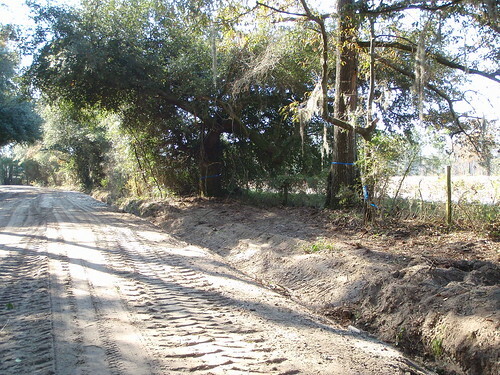 Pictured on the right is Old Bainbridge Road, Leon Co., Fla. Does it remind you of anything? Tallahassee is well known for its canopy roads. Valued by citizens, the roads offer a peaceful alternative to the typical city view of asphalt, cement, signs and visual clutter. They have canopy road regulations in the county code, plus a tree inventory, a management schedule, an interactive tour, and a printable 11 page brochure. "...one of our most scenic dirt roads. Because of slow driving along Magnolia Road, this detour will add about 40 minutes. Magnolia Road can be slick in rainy weather." 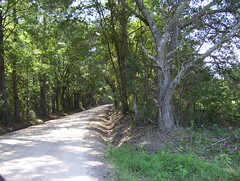 "Historic Magnolia Road is one of the most Picturesque in Leon County. 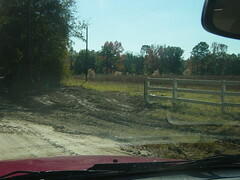 ...Remember to wave at those you pass -- it's southern tradition on dirt roads." "Drive slowly and enjoy the majesty of this beautiful road with its lush vegetation. 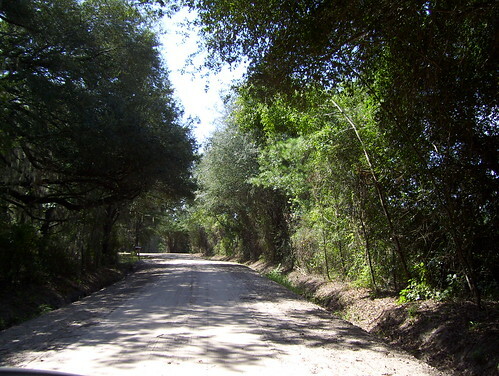 This first portion of Miccosukee Road was paved in the 1980s. Care was taken to preserve the rural character of the road; it is narrow and weaves to protect the canopy." Leon County is far from alone in Florida in having canopy roads. Sarasota County has 61 canopy roads, and a "Canopy Road Ordinance (Art. IV, §98-92)". Here are pictures of canopy roads all over Florida. Some are dirt, some are paved. Most have trees just as close to the roadbed as on Quarterman Road. And Florida is far from alone. Here's one near Buffalo, NY. Here's a writeup by the town of Mount Pleasant on Mathis Ferry Road, Mount Pleasant, SC, citing a state scenic roads program. Georgia has one of those, too. What about Savannah? Surely everyone has driven along Victory Drive. Or US 17 near Eulonia in McIntosh Co. on the way to Darien. If all that is not enough to address the safety issue, here's a canopy road that GDOT admits is 20% safer than other roads of its class: Forest Hill Road, Bibb County, Georgia. AASHTO standards are guidelines, not requirements. Obviously other places have managed not only to keep canopy roads with safety, they have turned them into tourist assets. That seems like a higher and better use than tearing them down. Previously we were also told by the county that Quarterman Road had been redesignated by the state as a collector. I checked Thursday, and GDOT says Quarterman Road, Lowndes County Road 160, is functional class 9, rural local road. GDOT tells me that this means the state does not tell the county what to do with this road: the state does not require a 60 foot right of way, and the county could improve or pave the road in any number of other ways. If the county took state money, the state might make requirements, but SPLOST VI is not state money: it's a local tax. There are paved roads in Lowndes County right now that are not 60 feet wide, such as Rusk Road, and if I'm not mistaken Chapelle Road. It's clear that Quarterman Road does not have to have a 60 foot right of way cleared, even if it is paved. Looking to see what it will take to tear down all the trees along the right of way! It's going up for bids Monday! Since then the county has put the road out for bids and they selected the low bid Monday Nov 3rd. Unless the commission stops it Tuesday Nov 11th, clearing starts Wednesday Nov 12th. We finally got a meeting with our county commissioner Friday Nov 7th (yesterday). "how to manage, protect and plan for the future of the canopy roads and canopy corridors in Tallahassee, Leon County." We can only assume that Lowndes County is unaware of these many examples of canopy roads in other counties. I'm sure there are people on Quarterman Road who would be happy to find out more about how other counties do it. 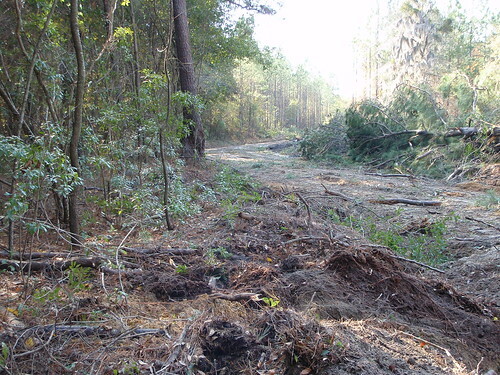 The first thing to be done is to stop the clearing of Quarterman Road, and we ask the county commission to stop that Tuesday. We also ask the county to establish a citizens' committee to evaluate canopy roads in the county and how to preserve them. How many county roads are there in the county? How are they being protected? What guidelines can we develop to preserve them? How do other counties maintain their canopies with safety for residents? This is a planning and zoning issue, not just an engineering issue. It is also a citizens' issue, not just a county government issue. The Lowndes County Commission meeting of Tuesday 11 November is public. The county government likes citizen participation. Help us preserve the rural character of our canopy road, and of Lowndes County. Y'all come! 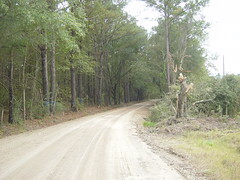 The majority of the households who live on Quarterman Road don't want the road paved. Please help us stop the county from tearing down this canopy to pave the road. Here's a video drivethrough, and one going in the other direction. Here's a video drivethrough of that canopy. Both these canopies will be destroyed starting Wednesday unless we convince the county commission to stop it Tuesday. If you live in Lowndes County, please write the the county commission asking them to save our canopy road by not letting any contract to clear the right of way on Quarterman Road. Like Valdosta earlier on a different railroad, the town of Berlin was founded because of the VM&W RR. ...the final depletion of the vast supply of timber about 1922 and the railroad systems which had played such an important role in the flourishing development of Berlin ceased operations. It's hard to tell from that brief quotation whether the end of the timber caused the failure of the railroads, but I wouldn't be surprised if it was a factor. I see the Lowndes County Commission has on its agenda for Tuesday 12 August a "Resolution in Support of a Four-Lane Project for State Hwy 133 from Albany to Valdosta. This is the same resolution that was before Colquitt County Commission on August 5. Before the Lowndes County Commission votes, it would be useful to know what have been the effects of Corridor Z, the four lane highway from Jekyll Island to Columbus by way of Tifton and Albany, also known as Ga. Route 520. Has it produced the effects the committee for widening Ga. 133 wants? Has it benefited agriculture and industry? Has it led to more opportunities? What ill effects on local landowners and environment did its construction have? And what do the people think who live along the route of Ga. 133? So who owns the land where the old Valdosta train stations were? The old Atlantic Coast Line station lot, at the U-turn between Patterson and Ashley just north of the downtown overpass, is owned by the City of Valdosta. That's kind of moot, since there are no tracks there now. As found on Lowndes County Property Record Search by searching for owner CSX. The county Health Department is in the middle of it, but the tracks run against the back parking lot. These are the tracks that go to Moody. The old GSF Station lot, just south of that, between Toombs and Patterson and north of Florida Ave., is owned by Norfolk and Southern. It looks from the aerial maps like it's being used for a park, and there's some sort of tiny building on it, too. These are the tracks that go to Hahira, Mineola, Remerton, Dasher, and Lake Park. If you select aerial photography you'll see that the tracks are currently located slightly differently than the map above shows. However, it appears that new Valdosta train stations could be constructed with agreement from nobody other than Lowndes County and the railroads. Well, them and the planning commission, and the county commission, and the Valdosta City Council, and the various cities the passenger service would run to. But the Valdosta station land itself seems to be in the hands of a small number of appropriate parties.